Summer is finally upon us and your feet are itching to hit the road! We’ve got a great list of amazing places you should try your hand at visiting (and all are super friendly and accessible to American and Canadian tourists!) If you like the vibe and energy of big cities or the laid-back vibe of quiet beaches, if you’re looking for wild parties or lifestyles of the rich and famous, this list has it all. Read on to find out some of the 10 Best Places for Canadians and Americans to Visit this summer! 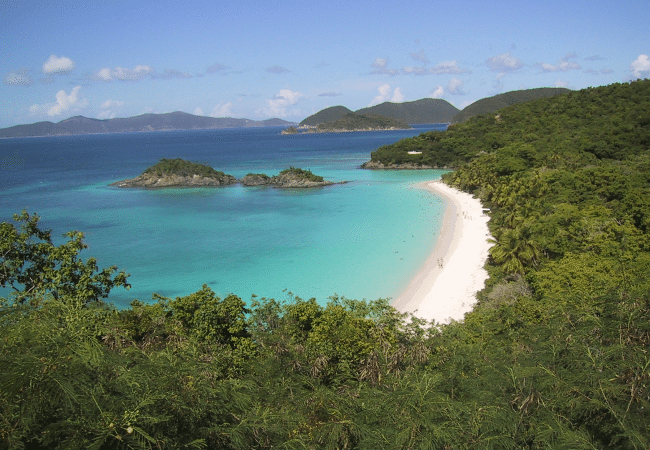 Trunk Bay in St. John in the US Virgin Islands is one of the world’s most stunning beaches (and Americans don’t even need a passport to visit!). Clear, calm waters and a 225-yard-long Underwater Trail make for amazing snorkeling and the calm inlets and hilly mountainside will see you catching some incredible views.